Animals have appeared in art from as early as the cave paintings of Lascaux, about 32,000 years ago. Since that time, animals have been depicted and used in art for various reasons; as symbols, as gods, as tools, as mere decoration. In a majority of art, especially contemporary art, an animal's most outstanding characteristics are often isolated as their only characteristics. Overwhelmingly, animals are stripped of their own identities and are used as empty vessels to be filled with the human drama of parody, satire and allegory. The popular conclusion is that animals are blank slates to serve as the medium through which we can showcase a message without the distraction of a complex human personality. Generalizations about species go on within the hyper-critical and academic context of art-culture without the slightest flinching. 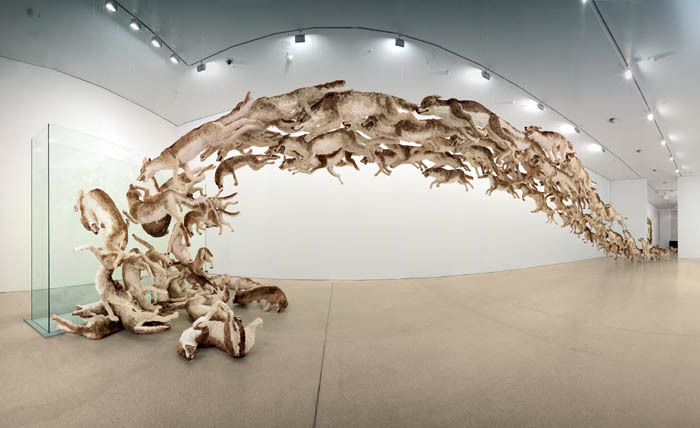 Cai Guo Qiang, Inopportune: Stage Two, 2004, papier mâché, plaster, fiberglass, resin, and painted sheep hide. Tony Matelli (b. 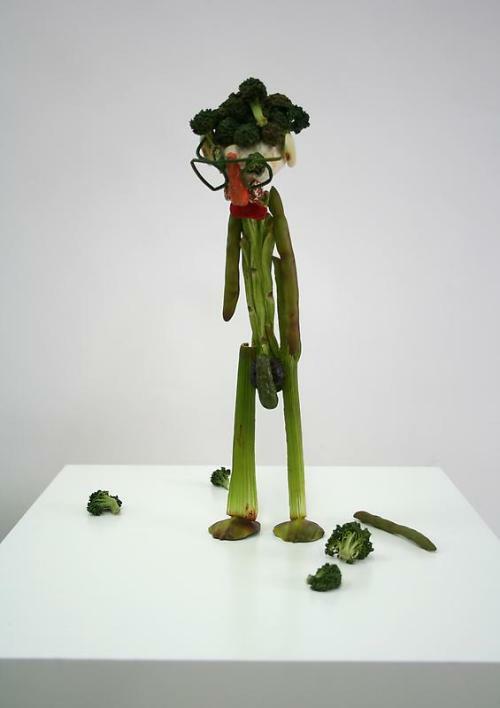 1971), known for his elaborately rendered sculptures, contributes Double Meat Head (2008)— a compelling self-caricature rendered from various cuts of meat. In its various stages of decomposition, the sculpture is a rumination on death, decay, and rebirth. How does one thing become another? Exploring the idea of death and rebirth in this context, I was compelled to ask what significance the conceptual death of an animal and it's "rebirth" as a meat-object has, and the secondary rebirth of that meat-object as a self-portrait of an artist, only to be (illustrated in painted bronze, not actual meat) decomposing once again. Often left out of the analyses of Matelli's work is the obvious distinction between vegetables (see below) and meat; they don't co-mingle - they are kept separate. If the work was simply about death and decay as it applies to the artist's mortality, there would be no reason to separate them. The 16th century artist, Archimbaldo - whose portraits constructed from vegetables, animals, meat, and other objects, also maintained this separation. The separation is significant - it showcases an awareness on some level that meat is categorically distinct. The story of meat, when not romanticized by Baroque hunting images, is rarely addressed outside of a few artists like Sue Coe. The story of the non-human individuals who become meat and art-objects is also rarely told in favor of having these animals serve the more simple function as vessels injected with anthropocentric symbolism and superstition. Biographies, personal stories, and valid individualism of animals is structurally neglected in mainstream contemporary art. One obvious reason is that we fail to validate animals as individuals who lead distinct, complex social and emotional lives. Another reason is that many of us, in our social rearing, have been warned not to anthropomorphize animals or nature for fear of projecting our own feelings and desires onto them (who are often seen as too dumb to possibly carry such complexities). And, while we share a closely-knit physical and psychological genetic lineage with other animals, it seems more popular to assume these creatures are blank than to allow the more accurate possibility, as Darwin and most of modern science has showcased, that in having well-organized central nervous systems, they might share characteristics like empathy, fear, anticipation of pain, and joy. What happens when actual animals become art, as opposed to simply being recreated, referenced or depicted? Many artists know this is somewhat controversial, and they know it will draw attention. Often the artist will make a claim of hypocrisy on the part of the outraged viewer; we live in a culture that exploits and devours animals on such a massive scale, yet it is often abstracted and hidden from view, so why is this one animal worth such outrage? In a gallery, which frames and heightens the aesthetic experience, the animal finally might be seen as an individual, and that percieved personality might conflict with the artist's intention. It becomes only natural to ask, who was this animal? Where did the artist get this animal? Was there an injustice done to this animal? Adel Abdessemed is an artist sensitive to racism, fascism, political corruption, and similar ideas, yet he fails to recognize the animal as a valid individual – or he does and perverts it for the sake of his video. The latter could be considered sadistic. Animal cruelty, unfortunately, is commonplace. But when art highlights an individual act of cruelty, controversy erupts. Controversy has always been a shock-artists best friend. One major concern in addressing this issue is that, like Damien Hirst (below) and other artists who brutalize, mutilate, and kill animals in the name of Art, they do so because they know it will get a huge controversial response from press and activists. Because it is impossible to define what art is, it becomes difficult to deconstruct and criticize the artist without bringing attention and thus money/power/influence to them and the institution that is featuring their work. In 2007, the artist Guillermo Vargas Habacuc, took a dog from the street, tied him to a rope in an art gallery, and allegedly starved him to death. He spelled “you are what you read” in dog food on the wall just out of reach. The artist would not confirm or deny what actually happened to the dog. “your outrage is part of the exhibit. Thank you for participating“. Because these animals can not volunteer to participate in the exhibit (and we must assume that they would choose to live based simply on all creatures’ observable will to live and active intentions to escape discomfort), we must question many of the artists who use real or live animals not as artists, but as human beings. An inability to empathize is considered psycho or sociopathic. Simply because a creature can not say “I do no like to be treated this way” in a human dialect (they do cry out and struggle, however) are we able to disregard their pain? Can the gallery setting justify anything?